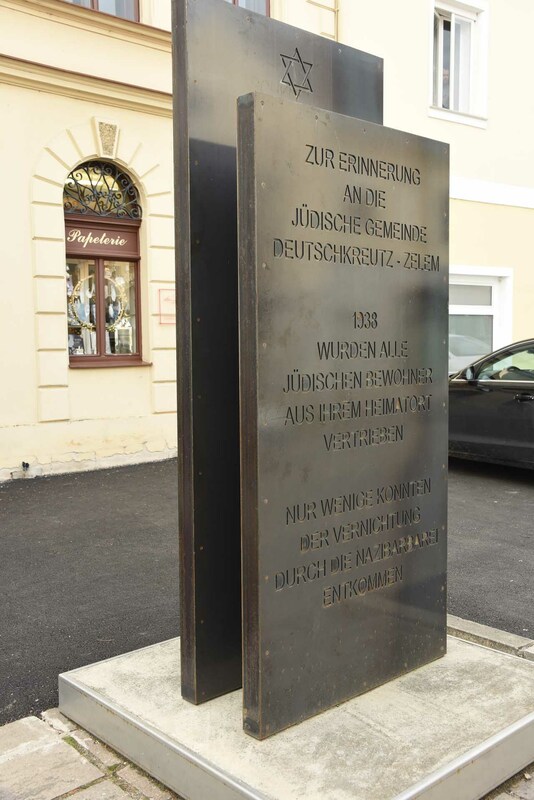 In Eisenstadt there is no Holocaust memorial. Again and again (from various political parties, the churches will be (see below the Letter from the pastor), As well as the Research Society Burgenland, etc.) Holocaust Memorial (!) Required for Eisenstadt. Concrete proposals for such a monument or a more detailed justification for such a memorial, but "it just lacked in Eisenstadt", at least to me are not known. That the requirements for a Holocaust monument in the state capital Eisenstadt were reinforced made in recent times, especially in connection with the common / bedenkjahr 2018, is no coincidence. more thinking / memorials in Burgenland were built especially in recent years. A Jewish museum can and this discussion does not want his city to escape, not least because a Jewish museum always is institutionalized actor remembering (s. To particularly our blog article "Peculiarities of memory„). 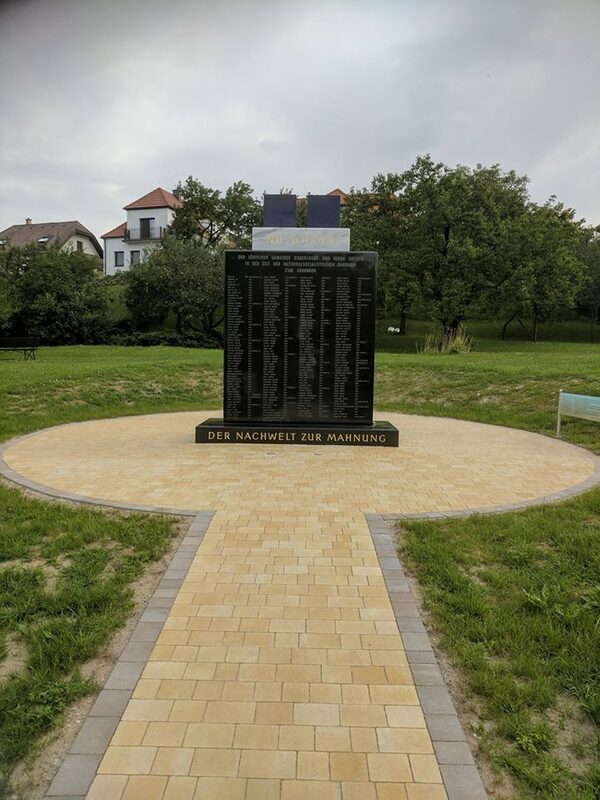 Deutschkreutz 2012 was "a pioneer" with a monument in the main street, followed in October 2014, Dedication of a memorial plaque at the Jewish cemetery in German Kreutz in memory of the Hungarian Jewish forced laborers. Initiator in both cases Mizrachi Austria (Vienna) and especially Michael Feyer. Michael Feyer it was also the one in 2017 with his club "We remember. 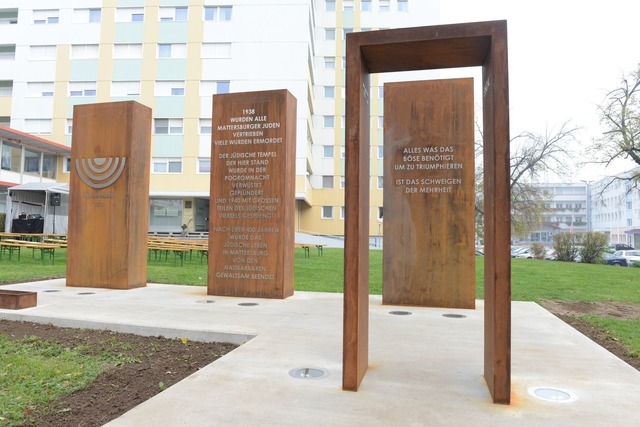 Encounter with the Jewish Mattersburg"The Holocaust Memorial in Mattersburg presented. A monument that dominates the very prominent Fountain Square and the ancient monument replaced at the site of the former synagogue, so to speak. For a critique of this monument see my comment below. Also in 2017 was the Memorial in Kobersdorf presents that had been initiated by the former mayor of the municipality, Erwin Steiner House. are on the monument itself, unlike the other monuments, including the names of victims, addresses, etc. Between murdered and displaced persons but did not differ, the list is also incomplete. Very sensitive and considered one went in Frauenkirchen before where built on the site of the former synagogue in the "Garden of Remembrance" and officially presented in 2016 was. The initiative was carried out by Dr. Herbert Brettl and the association "Initiative Remember Frauenkirchen". was accompanied / is the initiative of lectures and activities. Together, all these mentioned thinking and memorials first is the fact that they are places in which previously held no explicit and specific culture of remembrance, at least not with a clear reference to places or places in town that have the function of a place of remembrance. While there are in Kobersdorf, German Kreutz, Mattersburg and Frauenkirchen Jewish cemeteries, but they were never really active and permanently attached to the places in the memory work. In Eisenstadt there since 1972 our Austrian Jewish Museum, The oldest Jewish museum in Europe since 1945. It was in the heart of the former Jewish quarter, at the Palais des court factor and Hungarian national Rabbi Samson Wertheimer, expressly commonly referred to as memory and memorial to the seven communities and to the former Jewish community of Eisenstadt in particular founded! 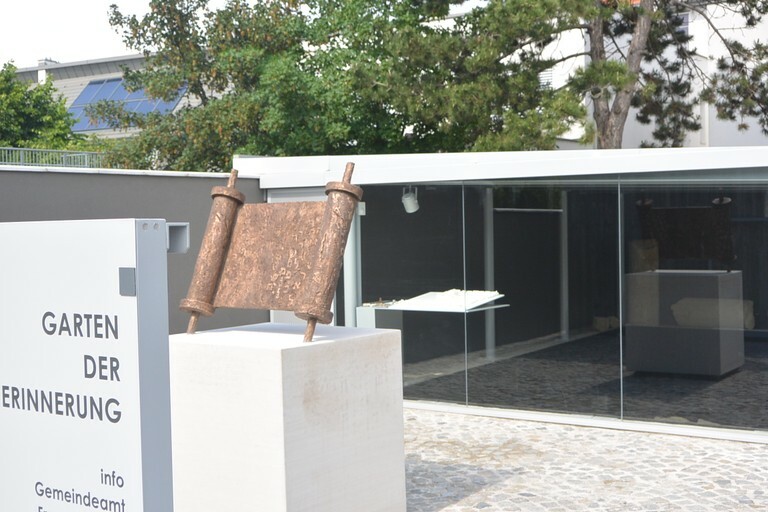 The museum is next to the synagogue, The only "living synagogue" of today's Burgenland, at the end of the permanent exhibition memorial roomWhich is dedicated to the memory of the Jews of the seven municipalities. The Jewish Museum is Location in the Jewish quarter, Located on the edge of this district is the two Jewish cemeteriesWhich are closely involved in museum work has always been and the only Jewish cemeteries in Austria, which are completely refurbished and well documented! Each cemetery has always primarily also commemorative character! Both almost all tourists and particularly the approximately 200 school groups from all over Austria, which annually visit the Jewish Museum, the Synagogue, the Jewish Quarter and the two Jewish cemeteries, do so as "active Gedenkakt"To the history of Jews in the city and the region. Since at least 1992, the museum pays them particular attention to the meticulous and painstaking analysis of the history of Jews in the seven communities, especially the Jews in Eisenstadt. All activities of this investigation were accompanied by the Eisenstadt and promoted (Print publication on the younger Jewish cemetery in Eisenstadt in 1995, Outdoor-Projekt "Ver (BE) time"2012 in the city of Eisenstadt, complete documentation of the older Jewish cemetery 2015 and complete documentation of the younger Jewish cemetery 2017-18 and all in connection with this documentation activities and events!). We prefer as a Jewish Museum alternative (!) Forms a monument for obvious practical reasons. Or in other words: Before thinking about a Holocaust memorial, we need to know the names and stories of people and their children and grandchildren are themselves no longer in Eisenstadt. This first step we consider to be a sine qua non. In particular, the processing of the younger Jewish cemetery has been in the so-called overall / bedenkjahr 2018 that - despite intensive work - still too many questions remain open: We do not know what happened to the children and grandchildren of about 500 late in Eisenstadt or in the death books recorded Jews has happened, we do not know many fates of the resident in January 1938 in Eisenstadt 446 Jews. See especially our blog post: Commemorative year 2018ff. Before the history of Jews and Jewish history is not so worked up that the most important questions about the fate of the Jews of this city can be answered, makes a "conventional" monument little sense, If only because it would require a permanent revision of this monument (at least if concrete numbers and names are noted on the monument, which we did - in whatever form - useful hold). So how do we avoid that the domestic population has / seen enough memorial after two weeks at the local way of thinking, the tourists can do little with the monument and descendants of victims in Monument see only a superficial handling of personally relevant history of their ancestors ? but most of these "conventional" thinking and memorials interchangeable, Can be set up, where once Jews lived, a maximum of printed local name needs to be changed in any place. And of course it also leads to confusion when a monument is not clear escape the suspicion of an alibi action: developed only to do "something" to change at worst gedenkaktionistische shape and / or political capital. is comparable to Eisenstadt Hohenems in Vorarlberg, where there is also a Jewish Museum is that in the former Jewish quarter is where there is also a Jewish cemetery are and where a lot of "small" details the history of the Hohenems Jews remember (buildings and street names, stumbling blocks and especially the permanent and living memory at the museum). And where there is also not a "conventional" thinking or memorial are, one is such a well is currently not considered or required. So there is currently no reason for snap shots, a thinking / Memorial, as required by various sides to implement. Quite the contrary, it has to go mainly to a permanent living memory work, far from political change and conventional, long disused forms of memory, regardless of official Dos and Bedenkjahren, free from suspicion of tokenism. It applies primarily to clarify the many open questions. This is a working process, take the few years that will but make the Jewish Museum with passion and highest meticulousness. This should a permanent and vital Remember be guaranteed. The entire work process is always the support and involvement of Eisenstadt need (from Matrikenamt to financial subsidies, etc.). One of the next steps is sure to have long planned with the city Eisenstadt panel (with plan and explanations) to install the younger Jewish cemetery (analogous to the board at the older Jewish cemetery). the outstanding issues to be addressed on the board. Accompanying this work of the museum, the "results" in terms of "should also be consideredStones of remembrance"To make the city visible. This too would be a sign of a permanent, continuous and living memorial and memory work. But since of course the displaced should be considered would be to consider whether to individual houses and squares, or possibly with a central memorial plaque, plaques with the names, occupations, etc. of there earlier resident Jews could be applied in the future. It must be able to be given to the question of why there are no Jews in Eisenstadt today and what happened to them in any case clear, accurate and understandable answers. There are already exemplary projects that deserve the highest respect: students of the high school short meadow in Eisenstadt developed in the overall / bedenkjahr 2018 'The traveling memorial - a project against oblivion„. Living, personal and concrete examination of the history of the Jewish students, the Holocaust. The ORF report begins with the sentence "In Eisenstadt there is still no memorial to victims of the Shoah." Gives me, especially in the specific context of the question. Had teachers, students still developed this beautiful project, if there were such a monument in Eisenstadt? "Must" to teachers, pupils in Frauenkirchen, Kobersdorf, German Kreutz and Mattersburg not as intense with the history of Jewish students deal, because there is already a monument in the village? but the living and permanent memorial and commemorative work can already replace a monument.